In our efforts to provide cashless transactions through digital channels, Chillr app is one more important step by our Bank to leverage technology to offer banking services anytime and anywhere. Unlike mobile wallet apps, Chillr is a first of its kind app that is linked directly to the customer's bank account. Thus, customers DO NOT have to reload money on their Chillr app. Collect money, split payments among users, etc. QR code based payments between individuals or to merchants. Every Saraswat Bank user on Chillr can earn reward points on inviting a new user to the app. User needs to share his/her referral code with the invitee and help him/her complete their first transaction to earn the incentive. 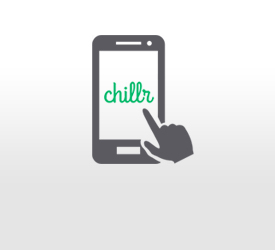 If customer is already registered for Mobile Banking he can directly download Chillr and Register. If customer is not registered for Mobile Banking app (GoMo App) then complete following simple steps to start using Chillr. *On successful registration on Chillr & use Mobile Banking Login PIN as MPIN to complete transactions on Chillr. This app can be accessed by all customers who are registered for Mobile Banking. Chillr app works on Android, Apple and Windows phones. In-app chat is integrated in the Chillr to provide immediate response to queries. Send an e-mail to support@chillr.in. Please mention your mobile number and issue in your email.